Many gamers probably assume that older consoles and systems have reached their limit. However, between homebrew games and discoveries, there are many new and newly unearthed titles that will surprise players after all these years. While they may not seem like much against today’s hyper-realistic titles, older games can still be interesting for gamers who enjoy the classic style of play. They’re also fascinating examples of lost works that uncover forgotten chapters in gaming history. Join us as we look at a pair of homebrew games for the Colecovision and Atari 5200 that bring new surprises for seemingly static platforms. It seems that certain eras and games can become inexorably linked in your mind, especially when they happen at a young age. Such is the case with a pair of classic gaming systems that began to arrive on shelves almost exactly thirty years ago this month. The Colecovision and Atari 5200 were released in August and November of 1982 and subsequently began a short-lived battle against each other which constituted one of the earliest console wars. Both super systems promised arcade-quality gaming and largely delivered the goods. They delivered an abundance of superb translations such as Atari’s Defender and Galaxian competing with Coleco’s Donkey Kong and Zaxxon for gamers’ attention. Unfortunately, both consoles would succumb to the video game crash less than two years later, becoming footnotes in gaming history, largely forgotten except for a small number of nostalgic players. These dedicated gamers kept the flames of the console’s alive through the decades and with the resurgence of the classic game hobby came the advent of homebrew games, small projects usually developed by individuals or tiny groups that offered players the chance to play newly programmed games and unreleased titles on these old systems. The first of these homebrew titles started to appear a little over a decade ago, which w as a joyous development for veteran gamers who’d filled out their collections. Recently, we have acquired two long-standing ‘dream’ titles that have emerged from the realm of vaporware and rumor to reality in the form of actual cartridges. Notwithstanding some minor imperfections, these new classic releases are quite exciting to see come to reality. When gamers unboxed their new Colecovision consoles, one of the more beguiling things about the package was a product catalog that featured an extensive list of upcoming games. Many of these titles such as Rip-Cord and Mr, Turtle would never see the light of day and would seemingly stay forever in the ether as games that never were. This made it one of the most famous examples of vaporware in the classic game era, with games that were forever out of reach. At least until now, that is. A programmer named Russ Kumro working with the hardware has spent many hours and years developing one of these games, It’s the infamous Side Trak, an obscure Exidy arcade game that was probably more famous for its appearance in the catalog than anything else. Side Trak never surfaced in the realm of prototypes and this version was impressively programmed from scratch. This is impressive achievement by itself, and the high-quality of the release speaks to the skill and care that’s gone into the release. The game plays a lot like the classic Atari 2600 title Dodge ‘Em but with a few differences, Your objective is to collect all the passengers on the track, while avoiding the opposing train. Colliding with it ends your turn and you lose a train. While Dodge ‘Em’s levels were strictly linear, Side Track adds some unique gameplay elements. There are some cool twists on a seemingly familiar formula that immediately remind us of the approach found in other Coleco games such as Lady Bug and Mouse Trap. You can change which set of tracks your train travels by moving the tracks before you reach the junctions, which allows you to speed out of the way or grab a few extra passengers. The tracks twist and turn in different directions, so you can move either east or west. The opposing train is a dangerous foe, making it very hard to avoid at first, but you can even the odds by memorizing its patterns and anticipating its moves. The first few levels are fairly easy to beat, but once things move on to the later levels, you’ll have much less room for mistakes. Adding to the challenge, passing the start gate adds an extra train to your line, which increases the points you get for each passenger, but also increases the danger, so you have to be careful. Side Track takes players back on a journey through memory lane, but its not an easy ride. 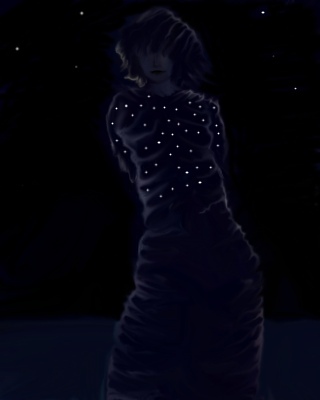 Later stages become increasingly difficult and the challenge becomes steeper the longer you play the game. Its definitely not something you can play casually, but the high level of difficulty makes you want to keep playing more. The game’s production values are superb throughout with a perfect re-creation of what a Colecovision game looked like back in the day. Its not too elaborate or primitive and strikes a good balance. One of the cooler aspects of the game is that Side Track looks exactly as it would have if Coleco had programmed it. The soundtrack is a different story entirely and features a classic rock song that’s quite appropriate and surprisingly elaborate. We won’t ruin the surprise if you haven’t played it yet, but Coleco sound effects maestro Daniel Beinvenu has created an excellent soundtrack that fits the action perfectly. We also need to mention Collectorvision’s Jean-Francois Dupuis, who produced the actual game packaging, which looks and feels like an authentic Coleco release, with a glossy box, excellent manual and nice cartridge that fits right in with the classic games. We’re very happy to finally get a chance to play Side Trak after all these years. Thanks to everyone involved in this for creating an excellent game that brings a forgotten gem back to life with style. Another title with an interesting back-story is Blaster, which finally emerged a few years back from the prototype realm. At first glance you might think that the game was based on the arcade game that appeared on the Williams’ compilations from a few years back, but that would be incorrect. There’s actually a more interesting story behind the game. 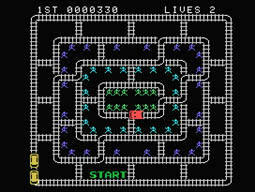 Its developers Eugene Jarvis and Larry Demar began work at Williams, programming the legendary Robotron: 2084. After this success, they split off on their own and formed a small development company called Vid Kidz. 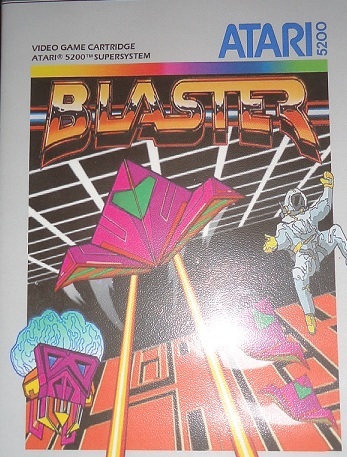 One of the projects they worked on was Blaster, a visionary 3D shooter that was originally created for the Atari home computers (800/XL/XE, etc.) and the Atari 5200. It was then converted into an arcade game, which saw limited release since it came out during the crash. The home versions were never released and Blaster was seemingly consigned to obscurity until the prototypes were discovered many years later. Blaster was an unofficial follow-up to Robotron that took place in 3D space with multiple levels and styles of play. The game begins as you fly over the surface of an alien planet avoiding and shooting an army of robots with you in their sights. When they hit the ship you’re flying, you lose a little bit of energy which can be replenished by grabbing one of the ‘E’ icons that come out. You earn extra points by flying through the gates and can speed up or slow down in order to fight them. After awhile on this level, you warp to the next stage, where you’re flying through a tunnel where astronauts are falling, collecting them earns you bonus points as well and once you’ve gone through this, you move onto the Asteroid field. In this stage, you objective is to shoot them and collect the astronauts while avoiding the UFO’s that attack you. The fourth stage returns you to the planet’s surface, but now you have additional enemies to contend with. Once you defeat these opponents, Blaster cycles back to the first stage. As is the case with many classic games, the action begins anew, with faster, harder enemies providing a stiffer challenge. It isn’t that complicated – you simply aim and shoot, but the different objectives in each stage keeps it from becoming monotonous. It also controls smoothly, with the 5200’s analog joystick perfectly suited to its 3D, flying mechanics. The gameplay is solid and entertaining, perfectly in-line with the frenetic pace of games like Defender and Robotron. The most impressive aspect of Blaster isn’t the gameplay, but its forward-looking approach to its presentation and visuals. Playing the game and comparing it against the arcade edition shows that the gap, while noticeable, isn’t nearly as noticeable as it was in other titles of its era. Instead of taking on the usual raster design that home systems were famous for, Blaster used an ambitious 3D engine that rendered wireframe objects that scaled and moved on the screen. This gives the game an appealing vector-graphics aesthetic that’s quite impressive considering the hardware it was programmed on had no inherent capacity for rendering. Considering the age of the hardware, and playing it in context within its timeframe, Blaster was definitely far ahead of its time in terms of scaling and technical expertise. You can appreciate how advanced the system must have been after you play the somewhat disappointing conversion of Star Wars: The Arcade Game that appeared on the same hardware. Utilizing sprite based visuals, the game doesn’t have the look, or match the speed of its coin-op cousin, which makes it fall short of the mark. The speedy visuals and intense pace of Blaster, by comparison, makes for an addictive and exciting title. While the prototype seems mostly complete there are some rough spots in some sections where the action seems to slow down. This is minor in comparison, and the game is still one of the most playable and enjoyable prototypes on the 5200, offering a fast, frenetic and addictive challenge to players lucky enough to own a copy. It was definitely a technical triumph, but unfortunately, as in many titles developed during that time became a victim of the great crash and was ultimately played by far fewer gamers than it deserved to. Playing Blaster and Side Trak after all these years, with their elaborate back-stories in mind, points to the unexpected moments of classic flashbacks homebrew developers give you. Not only do you get to play lost games that were thought gone forever, you can step into a video game time machine where you can relive a forgotten chapter of your childhood for a moment, reliving happy times or, in this case, experiencing new ones.